Combinatorial chemistry has developed rapidly in the past decade, with great advances made by scientists working on analysis and purification of a large number of compounds and the analysis of polymer-bound compounds. However, formidable challenges lie ahead of today's researcher. For example, high-throughput analysis and purification technologies must be further developed to ensure combinatorial libraries are "purifiable," and "drugable." 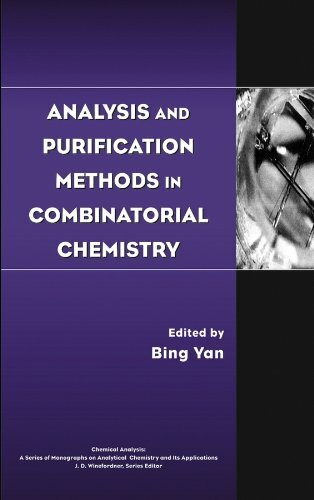 Drawing from the contributions of respected experts in combinatorial chemistry, this comprehensive book provides coverage of applications of Nuclear Magnetic Resonance (NMR), liquid chromatography/mass spectrometry (LC/MS), Fourier Transform Infrared (FTIR), micellar electrokinetic chromatography (MEKC) technologies, as well as other analytical techniques. This eminently useful volume is an essential addition to the library of students and researchers studying or working in analytical chemistry, combinatorial chemistry, medicinal chemistry, organic chemistry, biotechnology, biochemistry, or biophysics. BING YAN, PhD, was born in China and received his PhD in chemistry at Columbia University in 1990. He then worked at Cambridge University and the University of Texas-Houston Medical School as a postdoctoral fellow. From 1993 to 1999, he worked for Novartis in the Core Technologies area of preclinical research in New Jersey. He is currently at the Discovery Chemistry division of Discovery Partners International, Inc., in San Francisco. His major research interests are drug discovery, optimization of solid-phase and solution-phase combinatorial synthesis, high-throughput quantitative and qualitative analysis, and high-throughput purification of combinatorial libraries. He has written four books and published over seventy reviews and research articles.